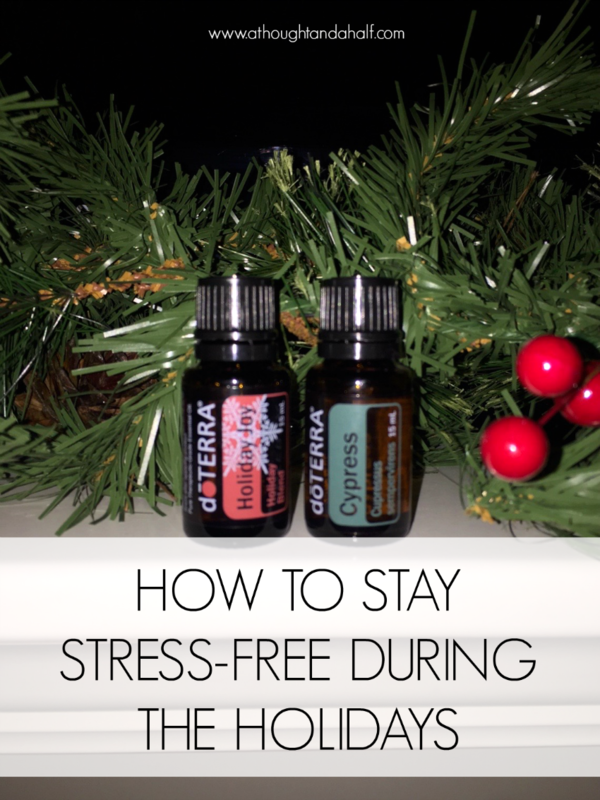 How to Stay Stress-Free During the Holidays + a Giveaway! The holidays are always a magical, exciting time of year. Christmas music plays on the radio (and everywhere else), red, green, silver and gold take over, everyone is out and about running errands and shopping, and not to mention the food and sweets this time of year are top-notch. Nothing beats the buzz this time of year. The holidays are also always crazy busy and sometimes stress-inducing. There’s just so much to do and seemingly so little time to get it all done. I’ll be honest, sometimes I have a hard time staying patient this time of year, with myself and with others. Staying stress-free isn’t always easy. Fortunately, there are some great ways to help stay (mostly) stress-free during the holidays! You may already practice some of these habits in your routine. If you don’t, now is a great time to try one out. So let’s talk about how to stay stress-free during the holidays. These are great in addition to my other 7 favorite ways to de-stress during the week. And psst… keep reading… there’s a giveaway below! Drink tea (or your hot beverage of choice) // I’m a huge fan of hot tea, especially when it’s chilly outside. Almost every type of tea is good for you in some way. I keep a stash of tea at home and at my desk at work so I can make a cup whenever I need one. Twining’s Christmas Tea is a seasonal favorite, and I also love Teavanna’s Youthberry + Wild Orange Blossom blend. Do yoga or stretch at night // I sound like a broken record when it comes to stretching and yoga, but only because I know how good it is for you! You don’t have to be super flexible, but staying in a stretching routine helps prevent injuries and keeps your muscles limber. Yoga is my favorite way to wind down and quiet my mind before bed, too. Take a real bath // Bath time isn’t just for the kids. I’ve started taking baths more often in the last couple of months, and it makes a real difference! It’s so nice to sit in warm water and just relax for 15 minutes. Baths are even better if you add some epsom salts, essential oils or bubble bath. I’m personally a fan of scented epsom salts in my baths. Get enough sleep // If I get any less than 5 or 6 hours of sleep, I become Grouchy McGrouchyPants, and no one wants to see that. Getting enough sleep and staying well-rested, and staying on track with a sleep routine, are key to low stress levels (and overall health). There are plenty of apps out there to help track your sleep patterns and help you establish a healthy sleep routine if you need it. Keep to-do lists // Staying organized is a huge part of reducing stress levels. I’m a huge proponent of to-do lists and shopping lists. If you write it all down, then you’re less likely to forget something! It also helps keep me from overspending, especially at the grocery store. Listen to Christmas music // My Christmas playlist has been on repeat for the last few weeks. It just makes my apartment feel so cheery and keeps the holiday spirit alive. Music of any kind usually helps me stay stress-free, but Christmas music takes it to a whole new level. Watch your favorite Christmas movie // My personal favorites are Rudolph the Red-Nosed Reindeer and A Charlie Brown Christmas. There is no way you can feel stressed or weighed-down after watching one of those. Many Christmas movies are light-hearted and will take any stress right away. Eat well // When you eat well, you feel good. This time of year, it can be hard to remember to eat well, because all I want is warm comfort food, like mac & cheese and chili. But keeping your diet clean and full of whole foods, fruits and veggies makes a huge difference in stress levels. Don’t forget to stay hydrated, too! Incorporate essential oils into your routine // I’m completely new to the essential oils game, but I’ve been interested in learning more and giving them a try for a while. There are so many oils with so many benefits that I don’t know where to start! Fortunately, my awesome coworker and friend Jordan is quite oil-savvy and has introduced me. She recently launched a side business called Essential Oils by J, in which she offers essential oils education and purchasing through doTERRA. You can find her on Facebook, Instagram and Etsy. Cypress essential oil from doTERRA – promotes energy and vitality; helps improve appearance of oily skin (read more). 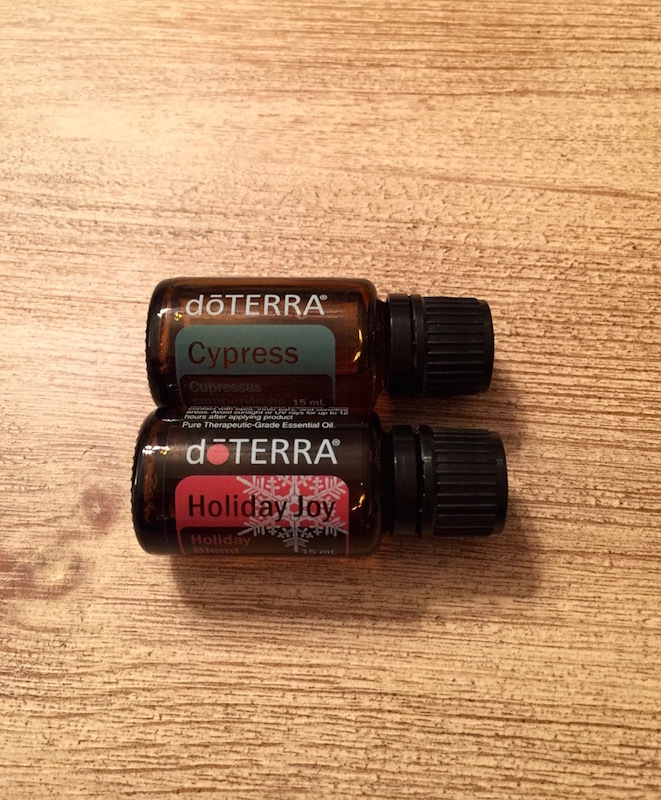 Holiday Joy essential oil from DoTERRA – uplifts mood, enlivens your senses; purifies and freshens air (read more). Giveaway ends Sunday, December 18. To enter, you can click to tweet and/or leave a comment telling me how you stay stress-free during the holidays! It’s that easy. Enter as you please, and tell me about your favorite ways to stay stress-free during the holidays (or any other busy time of year). Are you an essential oil user, or are you new to it, too?